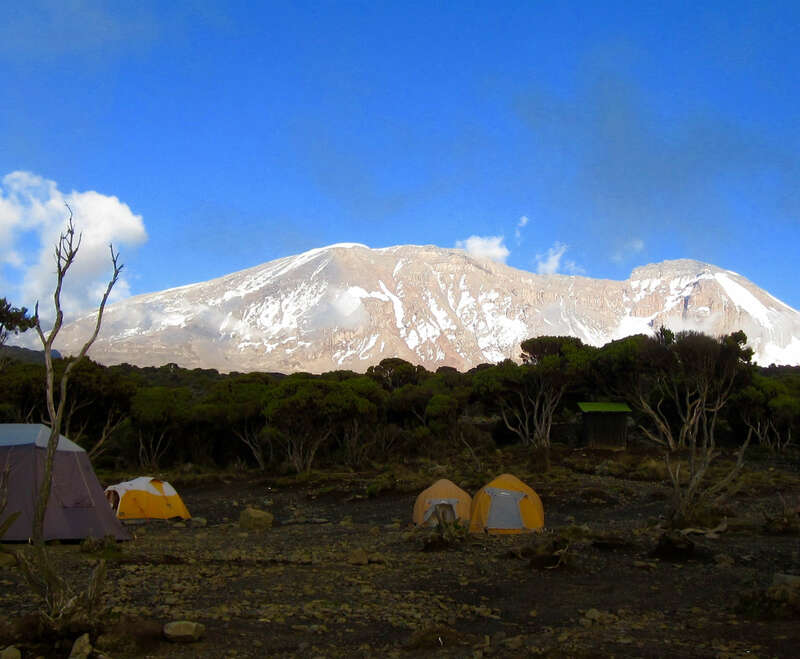 Kilimanjaro is located in northwest Tanzania and the mountain shares a border with Kenya. 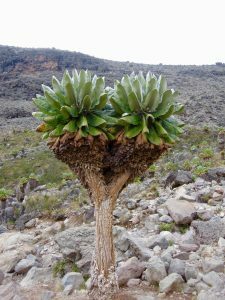 It's also a stratovolcano which means it is made up on three volcanic cones, Kibo, Mawenzi, and Shira. 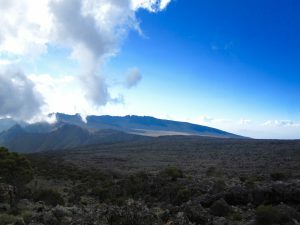 Mawenze and Shira are both extinct volcanos, but Kibo is dormant and could still erupt. 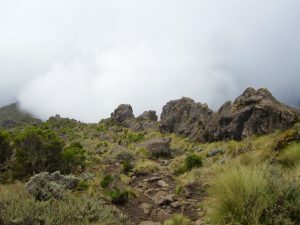 Uhuru peak is the highest point on Kilimanjaro and generally considered to be the summit. 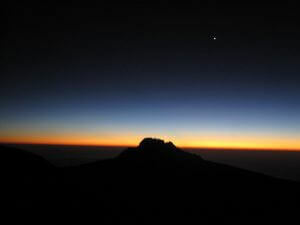 Some people say that climbing Kilimanjaro is like walking from the equator to the North Pole, and in a way it's true. You will trek through 5 different climate zones in 5-8 days. Mooreland has a lot of really unique vegetation including these weird looking trees called groundsels. They reminded me of something out of a doctor Seuss book. 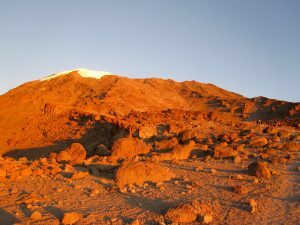 Near the summit is when Kilimanjaro starts to resemble a frozen tundra. 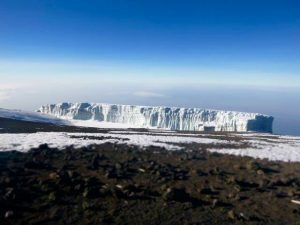 You might even spot a glacier up here. 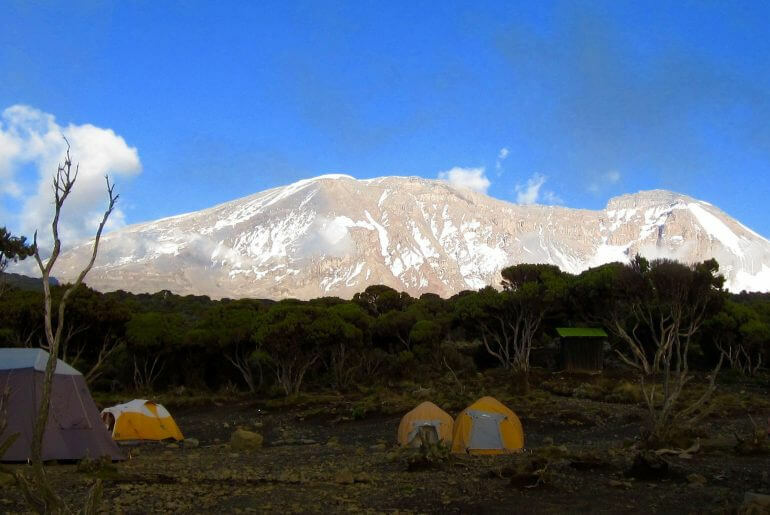 It is possible to climb Kilimanjaro year around, but it is best to climb when there is less precipitation. The dry seasons are from the beginning of December to the beginning of March and again from late June to the end of October. January to mid-March are the warmest months and typically have the clearest skies in the mornings and evenings. From mid-June to the end of October the temperatures are generally a bit colder but there is also less precipitation. The rainy season spans from the end of March to early June. I really wouldn't recommend trying to climb then unless you are an experienced climber. 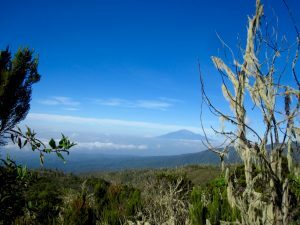 Kilimanjaro has 7 established routes and for a detailed look at each of them check out my other post-Kilimanjaro Route Options. 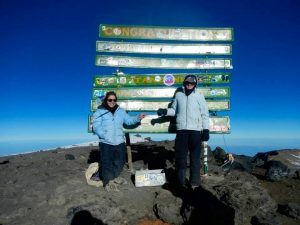 I had been debating whether or not I was going to try and climb Kilimanjaro for weeks. I was going to Africa to volunteer at a primary school called Charity English Medium School. 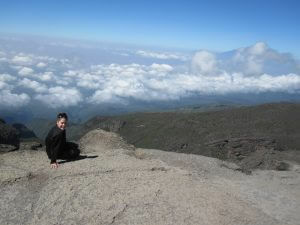 Before I left home I had even told myself I wasn't going to climb Kili. I felt that I was already spending enough money on this trip and my mom had been begging me not to go because she had read that an average of 10 people dies trying to climb Kilimanjaro every year. I’m so happy I changed my mind. 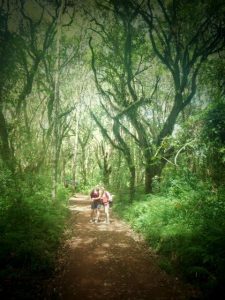 Here I was, walking through this rain forest with my two trekking buddies, Chelsea and Vivian, watching monkeys swinging from tree to tree right next to me. 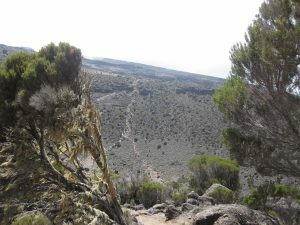 I could hardly believe I was in Africa, let alone trekking my way up to the highest point on the whole continent! The rainforest was dark even though the sun had been shining all day; there was just so much vegetation the sun could barely make it past the treetops. We worked our way up steep inclines only to find ourselves immediately winding back down the other side. After a couple of hours of hiking and getting to know our guides, Jon and Jeff, (realizing now those are doubtfully their real names) I eventually had to ask where I was supposed to use the restroom. 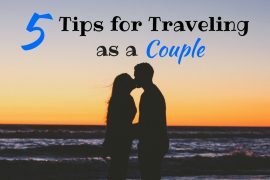 Jon laughed and said, “You go behind a tree, anytime you have to use the bathroom you say: 'I’m going to see a monkey', or…' I’m going to see a baboon' if it will...you know, take you longer.” I laughed and said, "I’m going to see a monkey and I will be right back." After hiking up and down the foothills (which to me already felt like mountains) for about 5 hours, there was a distinct change in the vegetation and climate. The trees turned into bushes and the air got cooler and less humid. 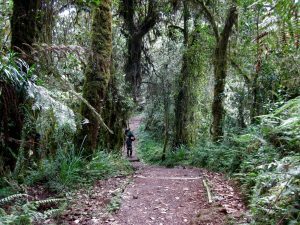 We had reached the heath/Mooreland area and you could finally see more than 5 feet in front of you, unlike the rainforest we had just been through. 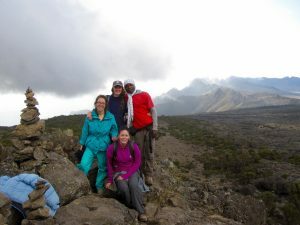 After about two more hours of hiking through the Mooreland, we reached our first campsite, Machame camp where we had a delicious dinner of chicken, potato, and vegetable soup. we were so exhausted I’m pretty sure we all fell asleep before the sun even set. The second day started out rough from the beginning because when Chelsea woke up she felt really sick. 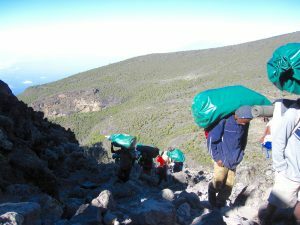 On top of that our guides initially told us that we would only be trekking 5-6 hours. By the end of the day, we had walked 9 hours and were completely exhausted (Good thing we had Vivian to lean on. I swear she was like an ox, she never got tired.) Poor Chelsea on the other hand, she definitely had a stomach bug or something because she was "going to see a baboon" every hour or so. The moorland was a rocky landscape littered with huge boulders we had to maneuver our way up and around like walking through a maze. Thankfully the weather was wonderful and we had a great view of Mt. Meru off in the distance. By the end of this very long day, we were so happy but too exhausted to show it once we got to the campsite. Fortunately for me, the only thing that hurt was my Achilles tendon from walking up such steep inclines. Other than that I just felt like I had been swimming all day; drained and ready to sleep. Once we arrived at the campsite, the beauty of the view blew me away. Looking out towards Mt. 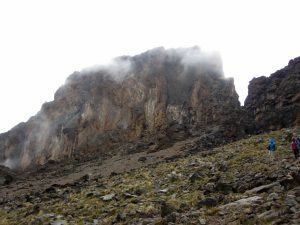 Meru was a huge drop-off, I imagine if the clouds weren’t there we could have seen all the way down to where we had camped the night before. Behind us was a clear view of the summit, which still seemed SO far away. 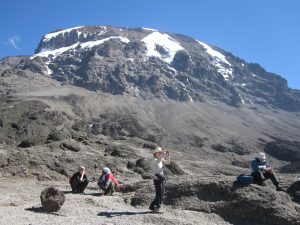 After we got settled we were told that we had to do an acclimatization climb. Getting back up and climbing more was just about the last thing in the world I wanted to do, but I knew that I had to if I was going to have any chance of making it to the summit. 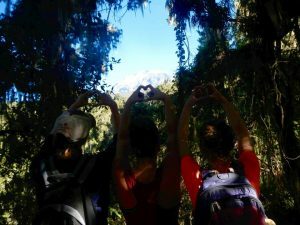 At the top of the acclimatization hike you could see all around, and the trail we would be walking the next day. There is no way to describe the vast beauty of this mountain and the fact that I had climbed to that point. It was really rewarding to look out and see for hundreds of miles. The next morning we woke up to clear blue sky and the summit smiling down at us. We were told by our guides how lucky we were for experiencing such great weather this whole time. After breakfast, we packed up and continued on. Finally, I could see the summit off in the distance. But in some ways, I felt as though it was making it more difficult because I could see the miles I had left to go in front of me. I had been walking for hours and it felt as though I wasn't getting anywhere at all. 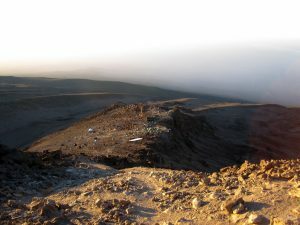 It was really hard for me to get going that morning and I could feel the altitude starting to get to me. I was breathing a lot harder and was feeling even more exhausted than the days before. 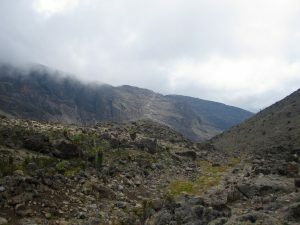 After hours of walking I could see our destination come into view, not our final destination mind you, but at least the next place we were going, The Lava Tower 15,190 ft.
Our last campsite was at 12,500 ft. and by the time we made it up to the Lava Tower I was exhausted and REALLY starting to feel the altitude. I had a terrible headache and felt extremely dizzy. We were supposed to have lunch at the top but I felt so sick I could barely eat anything. 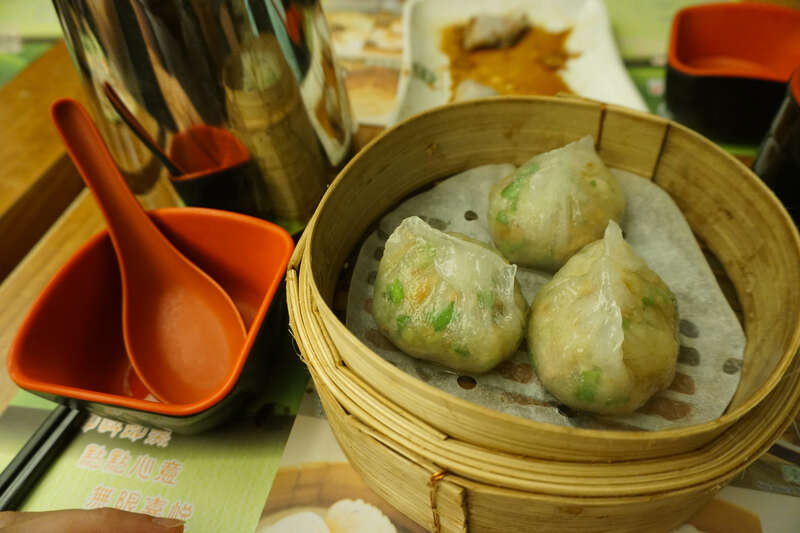 I rested for a bit in an attempt to build up the courage to eat, but when I finally did it was time to go. The clouds were rolling in and it started getting really cold. It wasn't too long after that when the sleet came (our good luck with the weather was over). We finally made it down from the Lava Tower to even ground and started winding through some hills and ended up going down for most of the rest of the day until we reached Barranco Camp (13,044 ft.) Much to our surprise, we arrived to find flushing western toilets! 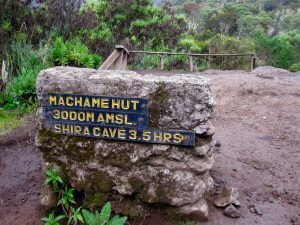 As we descended into camp our guides sheepishly (because they knew I was afraid of heights) pointed out our path for the next day. 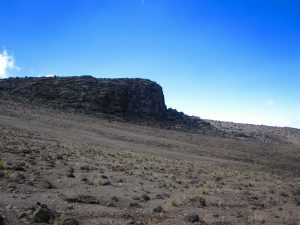 It wasn't a path at all but a wall, a really really big wall (Barranco Wall) that we were going to have to climb up the next day. It was so tall that the top half of it was covered in clouds so I couldn't even see the whole thing. I am pretty sure I had nightmares about falling to my death that night. The next day we started out by crossing a half-frozen river on our way to the wall, which was getting scarier and scarier the closer we got. I could see other people already making their way up who looked like little more than tiny specks of bright colored jackets. As we began to make our way up I could feel myself getting dizzier by the minute. I became more comfortable the higher we climbed as I told myself all I was doing was climbing over little boulders.... just some little boulders about 5 feet away from a cliff. Fortunately, there was only one point where I had to scale an actual wall. I had to force myself not to close my eyes so I could see where to step. Despite everything, this climb was definitely my favorite of the trip. It was like something you would see in a movie, a person emerging from over a cliff and discovering they had made it! There was the summit right there! Finally, it seemed as though we were really getting close! (Soon to discover we were not) We were above the clouds looking out over where we had just emerged from. It was such a fantastic feeling to make it this far. We soon started off again and began descending (yeah I know, didn't we just climb up and now we are climbing back down again?) We climbed back and forth down a switchback trail until arriving at a VERY steep descent down into a valley. Once we got to the bottom.....you guessed it, right back up again. If they had built a bridge across this ravine it would have been a lot easier! (At this point I was obviously wishing for a short cut or two). Luckily when we arrived on the other side of the ravine we could see the camp where we would be eating lunch. Up and down, up and down, again and again until we made it to our stopping place for lunch. This was when the altitude really started to hit me. The rest of the day was a blur because I was extremely dizzy and out of it. The people who were taking 7 days to climb stayed behind, but we (unfortunately) pressed on (FYI--STAY THE EXTRA DAY FOR A BETTER CHANCE OF MAKING IT TO THE TOP). 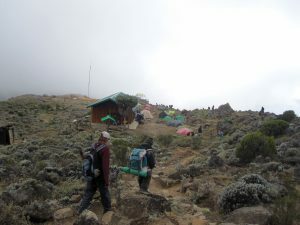 We walked for what seemed like hours before arriving at base camp. Finally, we had made it, we were at base camp! We ate dinner and went to bed as soon as possible because we had to wake up at 12:00 am to start our summit hike. 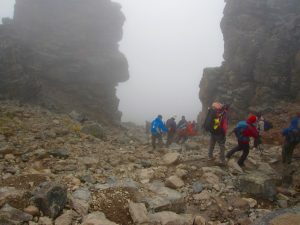 I asked why we couldn't hike it during the day but our guides said that during the day the wind was too strong to stand on the top of the mountain. When I woke up I was feeling better, tired and a little out of it, but not as dizzy as before. We started walking in the dark, with only our headlamps to direct us. It was probably about 15 degrees (Fahrenheit) and the wind was blowing pretty hard. As we started hiking up what scared me the most was not being able to see where the edge was, but knowing it was there. Maybe it was a good thing that I couldn't see; it might have made me dizzier. About 4 hours into the hike I started getting extremely dizzy and had to start using my hiking poles to balance myself. When we would climb up big rocks I felt as though I was going to fall over backward. Every time I stopped to take a drink of water I would stumble backward a few feet before catching myself. I knew the altitude was affecting me and so I told my guides what was going on. They looked at me with sad eyes and said that it was only going to get worse from here... At that moment I realize that I needed to turn around. I didn't want to be one of those people I saw being carried down the mountain because they ignored the signs and pushed on. That decision was one of the hardest I have ever had to make. I wanted so badly for nothing more than to crawled up the rest of the way up! But the summit was another good 2-3 hours, 400 meters, and 1,312 feet away from me. In the end, I turned back with one of our guides, Jeff, and watched the sunrise on the way back to camp. It really was amazing being up there. After arriving back in camp around 7:30 am I fell asleep while I waited for Chelsea and Vivian to get back. 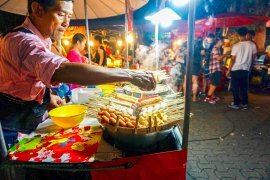 I was hoping that they would make it and they did! I even gave them my bracelet to tie to the top for me. Chelsea and Vivan got back around 11:00 am, they had made it and said it was amazing! But also that it was good that I turned around when I did because they saw a lot of people being carried down on stretchers or even on their guides back. After resting for another hour we had brunch and started the descent. We opted to stay at the closest camp that night and hike more the next day because we were so tired. We hiked for about two hours and went to bed around 7:00 pm. The next day we hiked all the way down to the bottom. It only took us about 5 hours but man did it hurt. Going down that fast is extremely hard on your knees. By the end of the hike I was almost to the point of tears from exhaustion and pain, but I did it. I was disappointed that I didn't make it to the top but the days and energy I put in before that final 1,300 feet were so hard, I was proud to have made it that far. It was a tremendous accomplishment and I can't believe I did it! 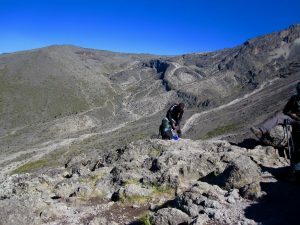 Altitude sickness or AMS (acute mountain sickness) is real and if your guides think that you might be experiencing the symptoms it is really important to descend as quickly as possible. But don’t let this scare you! 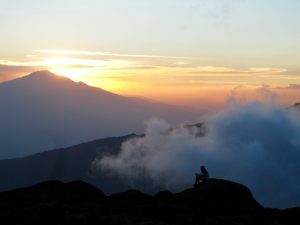 This is why I fully believe in taking as many days as you can to climb Kilimanjaro. 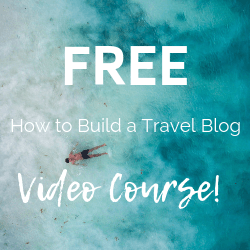 The more time your body has to get used to the altitude the better your chance of making it to the summit! 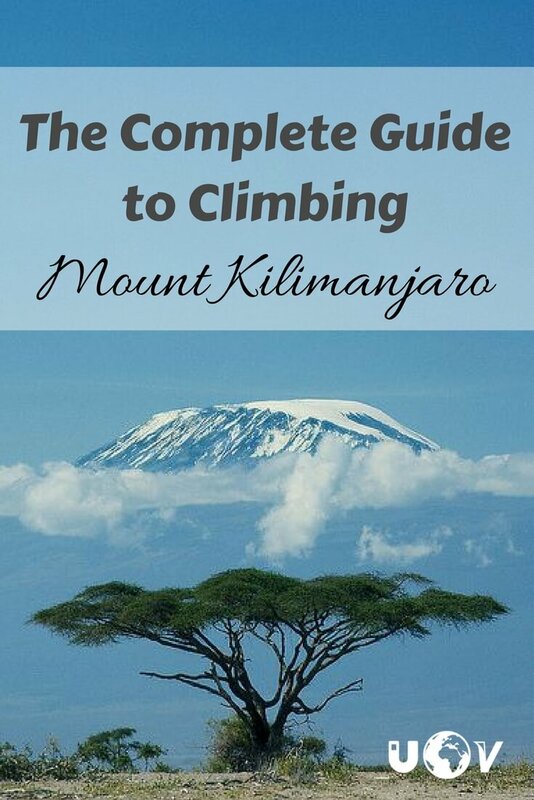 Have you climbed Kilimanjaro before? Leave a comment below and let us know what helped you with your climb!